Wow, I can’t believe that it’s been over 3 years since I’ve posted anything here. Actually, I can believe it, because the last 3 years have been a bit of a whirlwind. New job, new city, new house…and while I have managed to squeeze in time at my machine here and there in the last few years, it’s been difficult. But I miss it, and decided recently to make an effort to get back at it. I have been working at finishing some long-neglected WIPs, as well as starting (and finishing!) some newer projects, too. It feels good to actually have some finished projects to share. It’s been far too long! 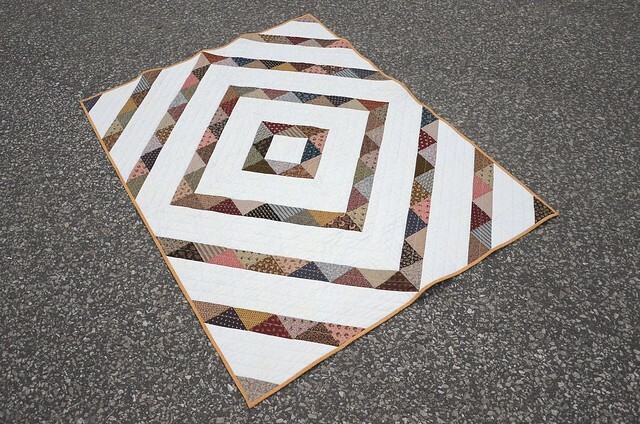 The quilt that I’m sharing today is from the second group; a newer project that was a priority so it was bumped to the front of the line. 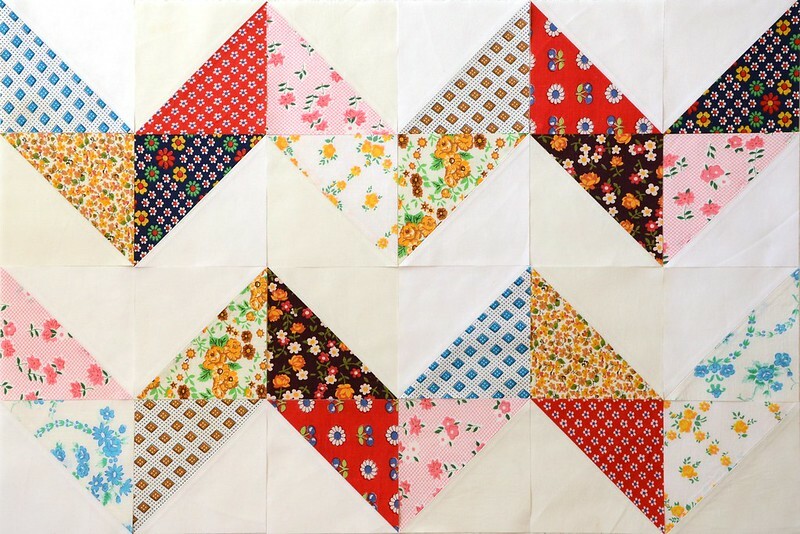 My maternal grandmother, my “Nana,” has always been the quilter in my family. She took a class at some point in the early 80s and was hooked. It was from her that I learned fabric buying tricks such as “just get a yard if you love it!” and “it’ll just work in somewhere, you know?” Clearly, the absurdly large stacks of fabric in my house are her fault. :) I also learned from her to being brave and bold with colour combinations, to enjoy the process, and, maybe most importantly, to be social in my craft. 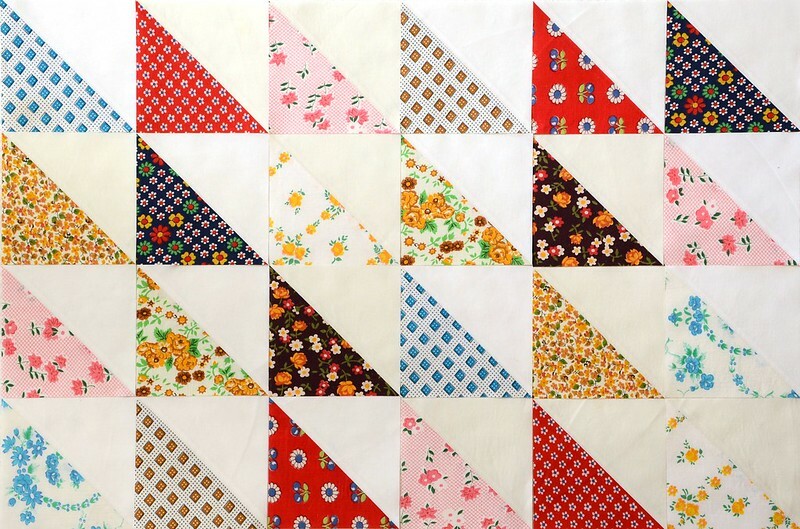 For many, many years, when she and my grandfather lived in Kingston, she belonged to a quilt bee at her church that would quilt tops that people brought them, and the money they charged would go to charitable activities. Often, people would bring them a poorly constructed flimsy that they had found in an attic and the intrepid ladies would have to find a way to make it work! During my undergraduate degree at Queen’s, when I was also living in Kingston, I would have dinner at my grandparents’ house every other Sunday. My Poppa would pick me up, and then Nana and I would sit and have tea and quilt, on either side of her large frame, while Poppa would fuss over whatever roast he had decided upon for dinner. Nana has made her 2 daughters and 5 grandchildren a few quilts each, including special wedding quilts for both my brother and sister. 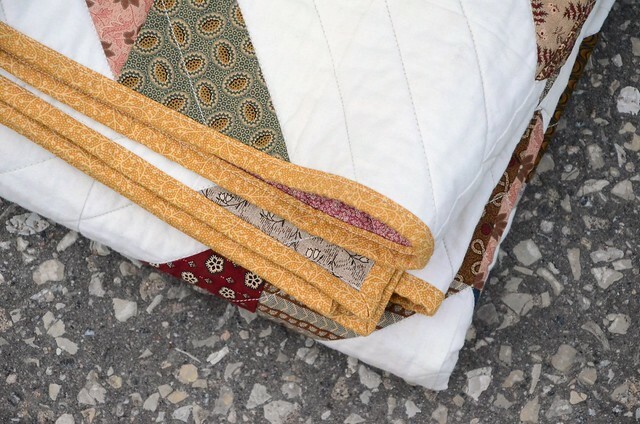 She usually pieces her quilts on her vintage featherweight, and then she quilts them by hand. 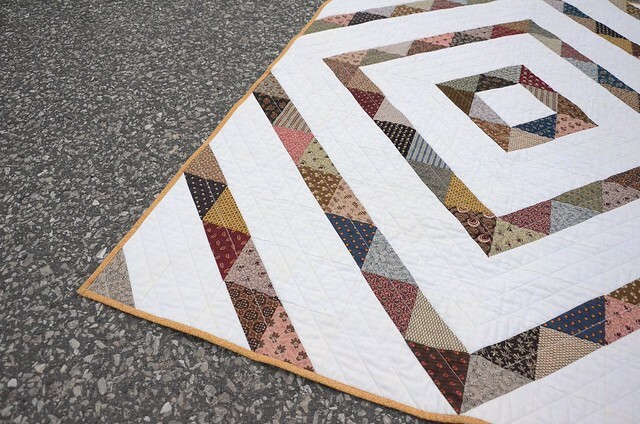 The hand-quilting has always been her favourite part of the process. Last summer we were talking about her next project, and she admitted that there were some favourite stacks of fabric on her shelves that she didn’t think she would ever get to, in part because she was 88 (although I could frankly make a similar admission at 36), but also because her piecing just wasn’t what it once was. 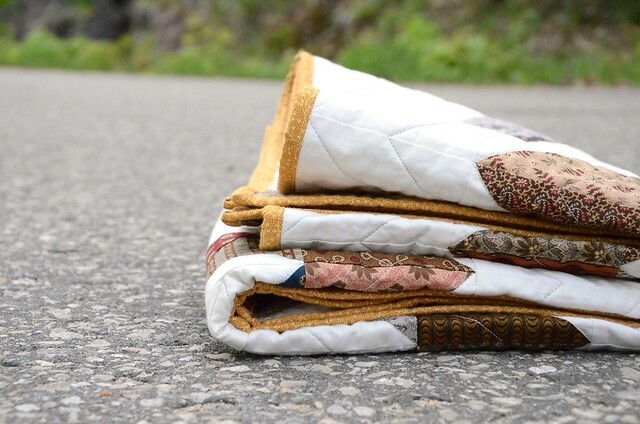 I offered to piece a few tops for her with her favourite fabrics, and then she could spend the winter quilting them. Well, the universe intervened, and in November she took a nasty spill and broke her right (dominant) arm and dislocated her right shoulder. 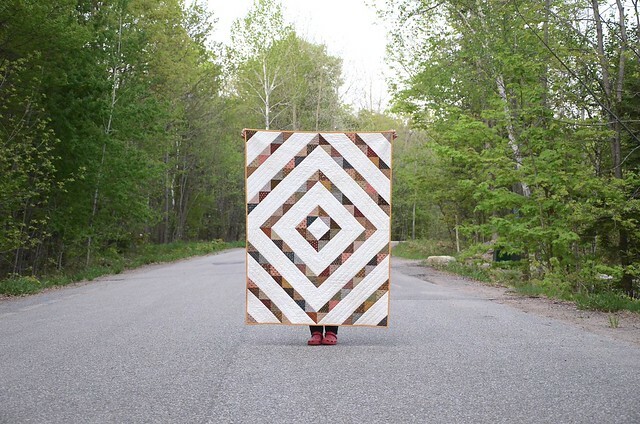 She has since mostly recovered, but it is clear that her quilting days are behind her. So for her 89th birthday in April I finished up one of the quilts as a gift: the first time that she has been on the receiving end. The colours are more her than me, but the design is more modern and minimal than what she would have done, so while it’s not the collaboration that I thought it would be, there is still a bit of both of us in it. And she’s thrilled with it! 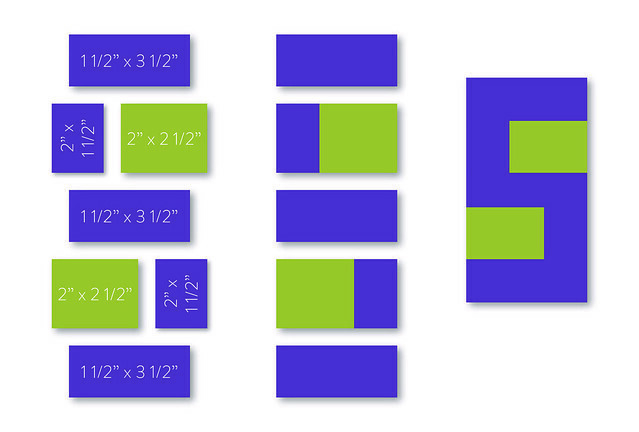 If you’ve stopped by in the last few hours, and you’re wondering what the heck is going on, I’ve been auditioning new theme templates for the blog. And I can’t find one I like. So bear with me. I also have a few new posts waiting as drafts. Yippee! 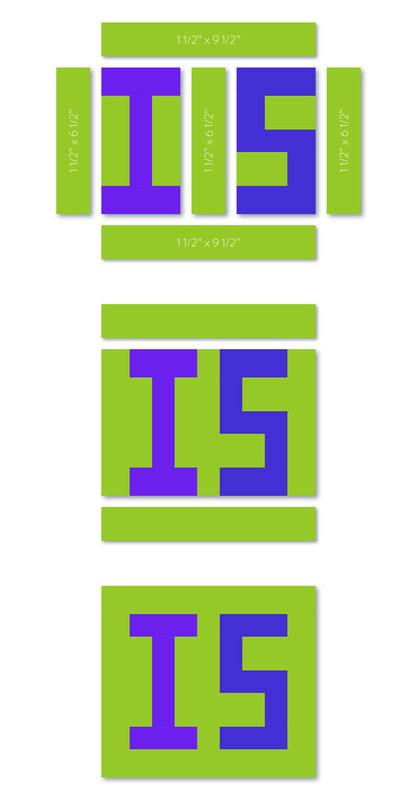 Well…it seems, after hours of trying to make some off-the-shelf themes work and failing, that I am going to have to dive into CSS Customization and create my own design. 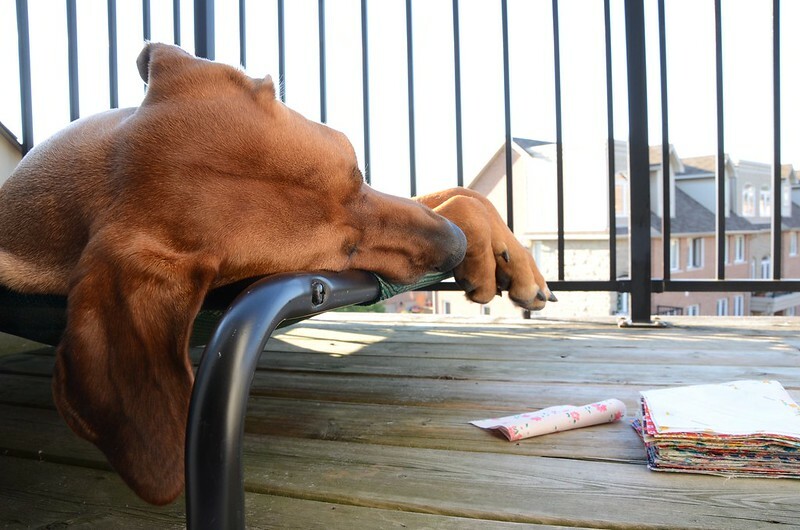 Double blerg. To be honest, it’s been something I’ve wanted to learn for some time, and was on my “tackle this in 2013” list…and it’s 2013, so I guess there’s no time like the present! I’m generally pretty comfortable with trial and error plus Google, but if anyone knows some really great online resources I’d love to hear about them! So tomorrow is November. Which means that Christmas is dangerously close. Dangerous because I have a few projects that I’d like to make as gifts and I’m not sure that I have enough time, and also because there are a few people (brother…father…) that are super difficult to buy / make for. I started an ideas list earlier today, and there are some people for whom I have enough ideas to last me 5 years of Christmases and birthdays. But the men? Eeesh. There are also a few projects that I’d like to make for myself. You know, the decorating kind. 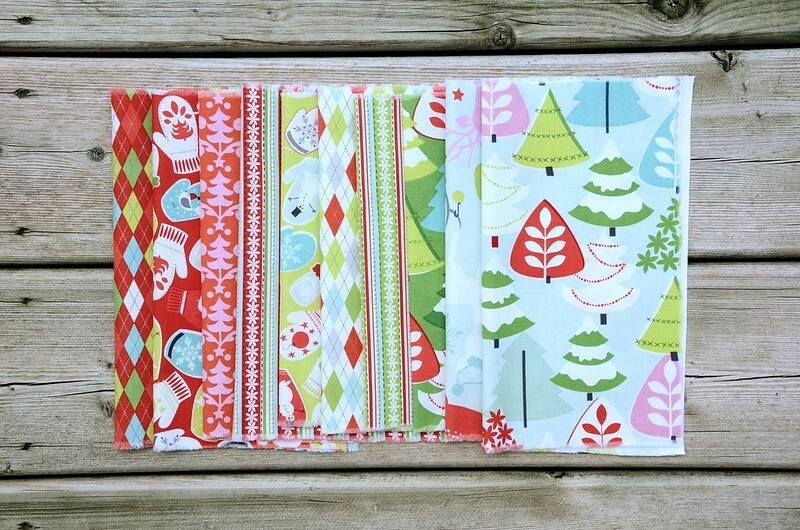 I’d love to make a tree skirt, and a throw quilt for the sofa, and a few other bits and bobs. But if I’m being perfectly honest the things for me will likely have to wait for another year, since I have so many other things in the queue at the moment. Oh well! Next year! 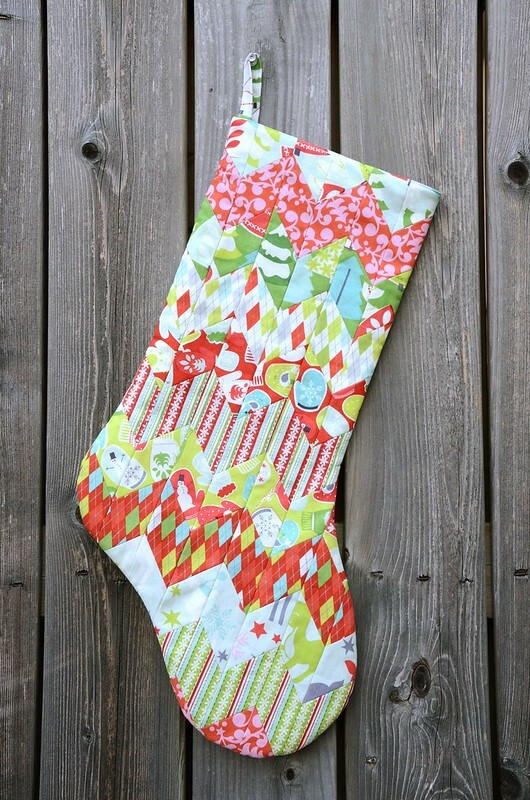 One thing I DID get done (because I had a deadline in September…), was make a stocking! The last week in August the team at Fat Quarterly tweeted that they needed some people to participate in the Designer Challenge for the Christmas 2012 issue, and I decided to throw my hat in the ring. I had never submitted anything to a publication before, but I’d been thinking about trying, so this seemed like a great place to start. 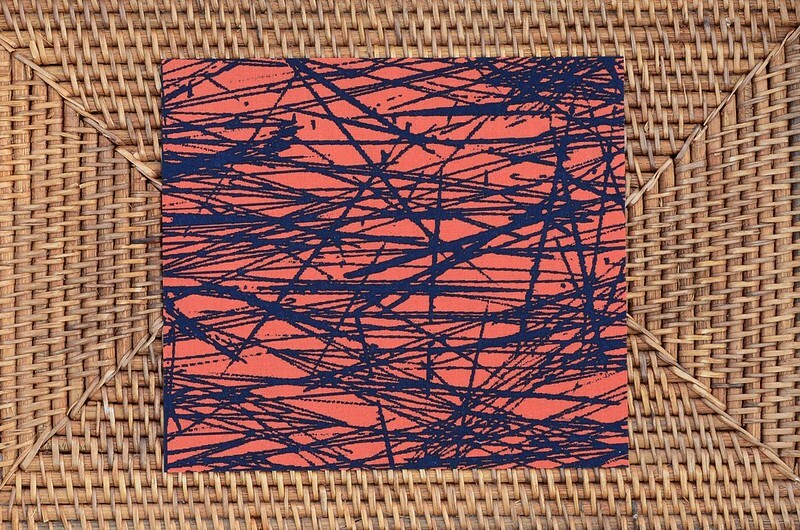 The fabric we were to work with is the line “Tinsel” by Maude Asbury for Blend Fabrics. Isn’t it cute? (I don’t currently have much use for cute Christmas fabric, but if I did I would be buying lots of those mittens. I love them!) And the only instructions were to design a stocking. 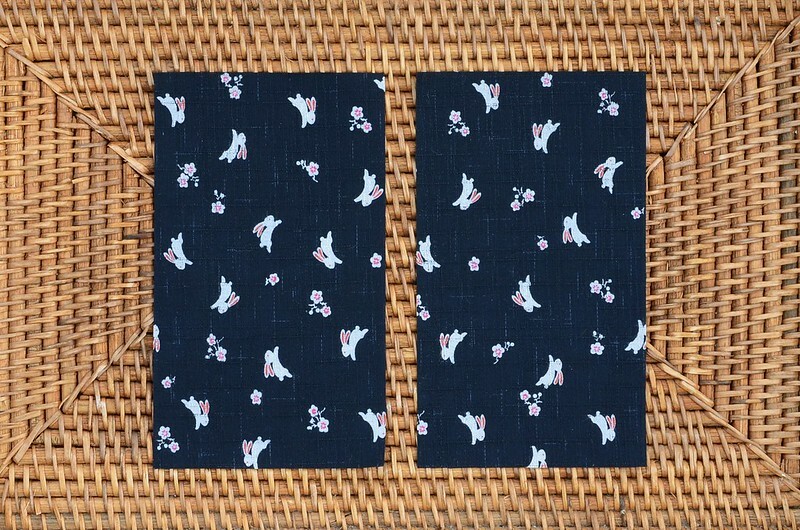 I must admit that my preference is for knitted stockings, perhaps because that’s what I grew up with, and so I wanted to design a stocking that riffed on that idea while still being a pieced fabric project. 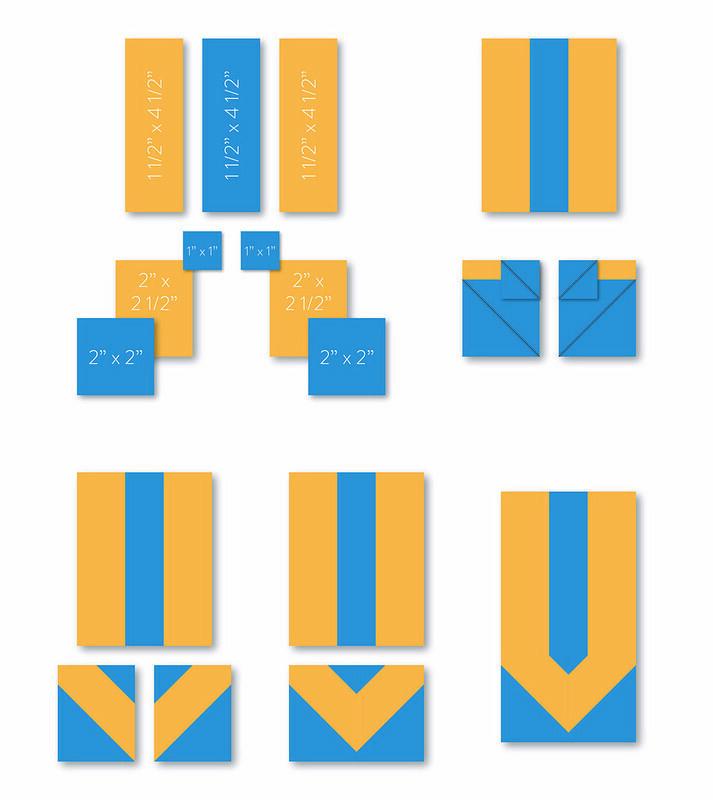 So I drew a couple of ideas out and finally settled on a design. It’s supposed to look like knitted stockinette stitches, hence the name. I’m really pleased with how my project turned out, and I’m already working on a few other ideas to go with it. I figure I need at least two stockings in this house, one for me and one for Stella! And if you DO end up making my stocking then I’d love to see it, so be sure to add a photo to the Fat Quarterly Flickr group, as well as the thought & found Flickr group. How about you, what’s on your homemade gifts project list this season? And do you have any gift ideas for a 26-year-old?! Earlier this summer I was cleaning off an old shelf in my office/studio, and I found my old Daytimer from highschool. I think I bought it around 1996, and it was the analog equivalent of an iPhone. 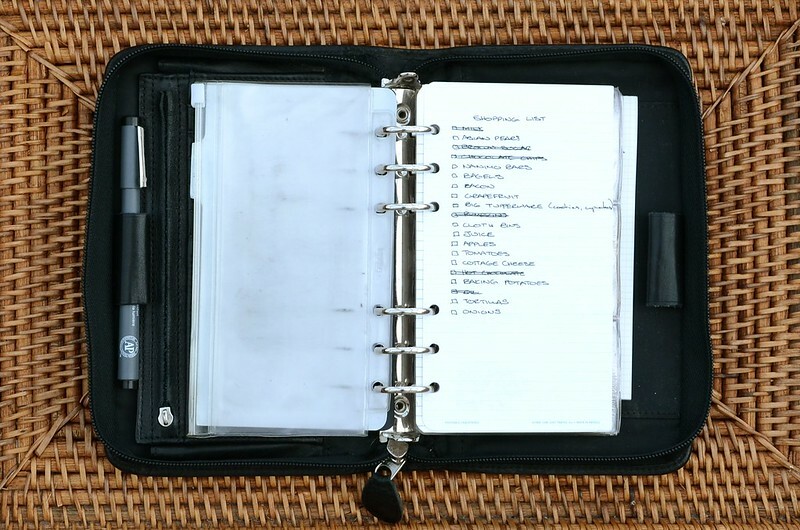 It was my wallet, my address book, my to-do list, my sketch book, my calendar…it was ALWAYS in my purse. It was also a big splurge for me, since I bought a really nice leather one, and I think it cost me a little over $100. That was a lot for a 16-year-old to spend on a single item back then. Which is probably why I never threw it out. 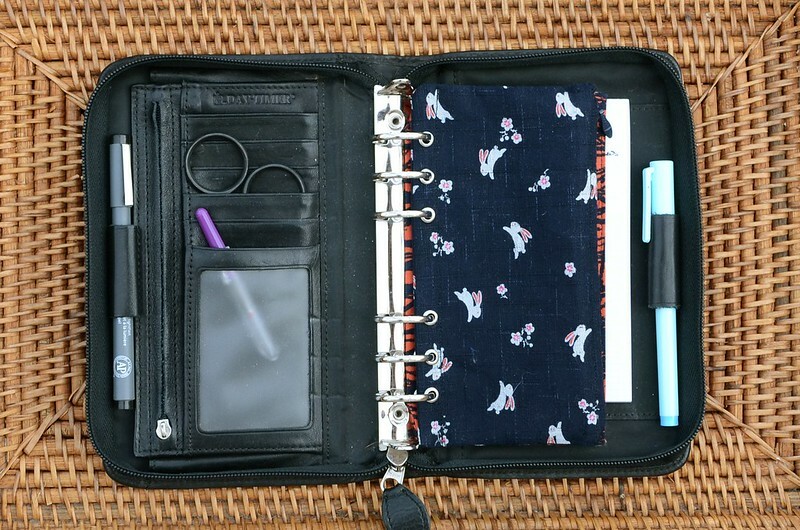 When I found it again it occurred to me that while I no longer need it to organise my life, it would be a great way to organise all my little crafty tools for travelling! 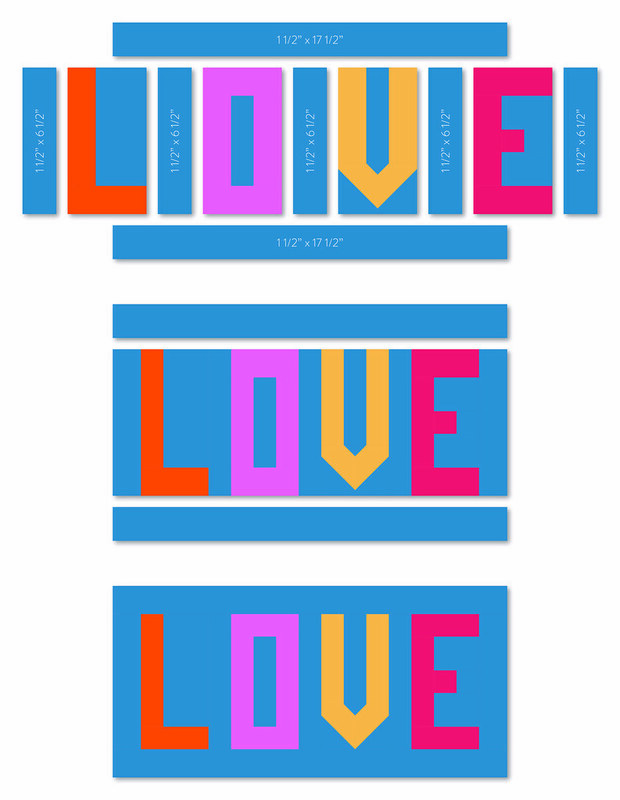 And so I began brainstorming some new inserts that would help me to keep things in order. I have two mini tutorials for you today, but I have lots of other ideas so hopefully there will be a few more to come in future! 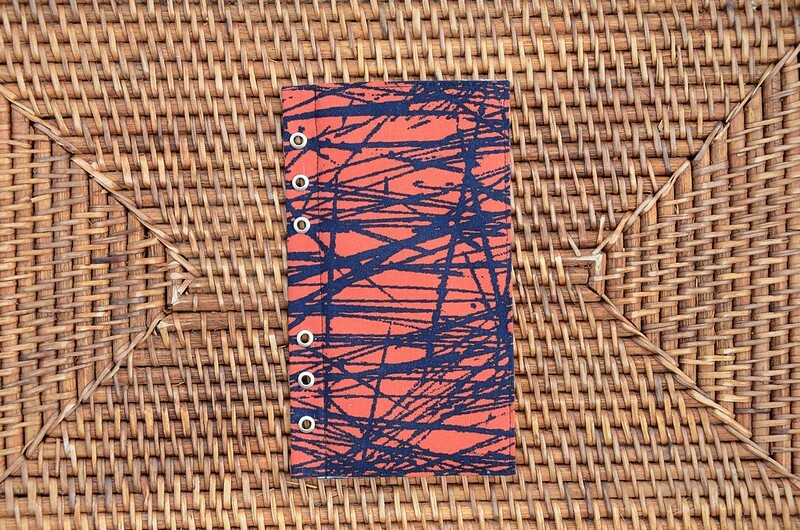 The first insert that I’ve designed is a needle book for keeping track of all the pins and needles you need to have along on any crafty trip. 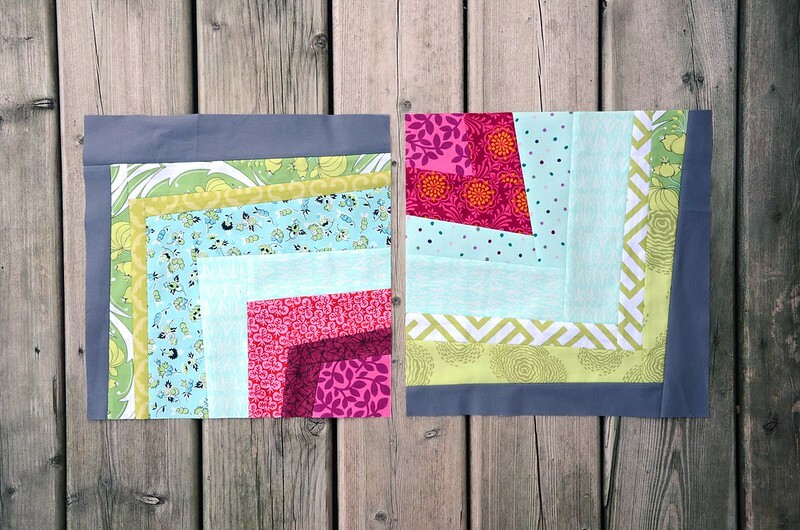 Begin by cutting out a piece of fabric 8″ x 9″. 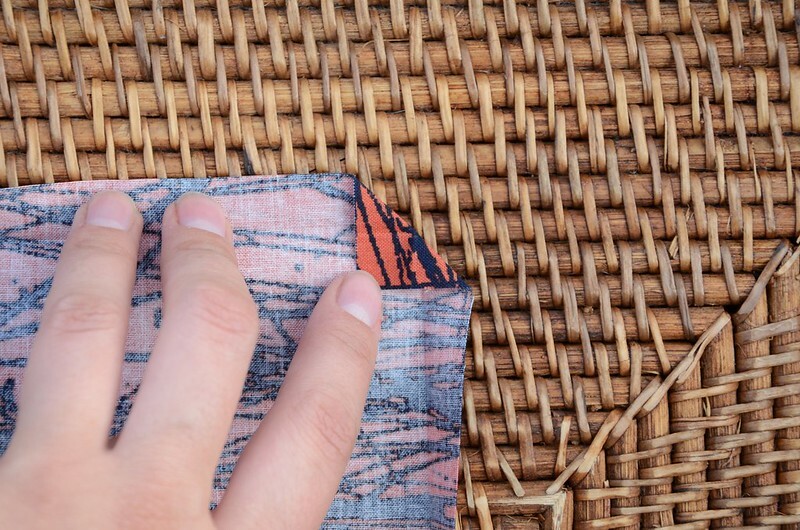 Fold in all four edges, wrong-sides together, 1/2″ all the way around, and press the fold with your iron. Open the folds back up, and then fold the corners in so that the place where the two fold lines intersect are at the centre of the new fold. Next fold the edges back down so that there is a nice point at each corner. 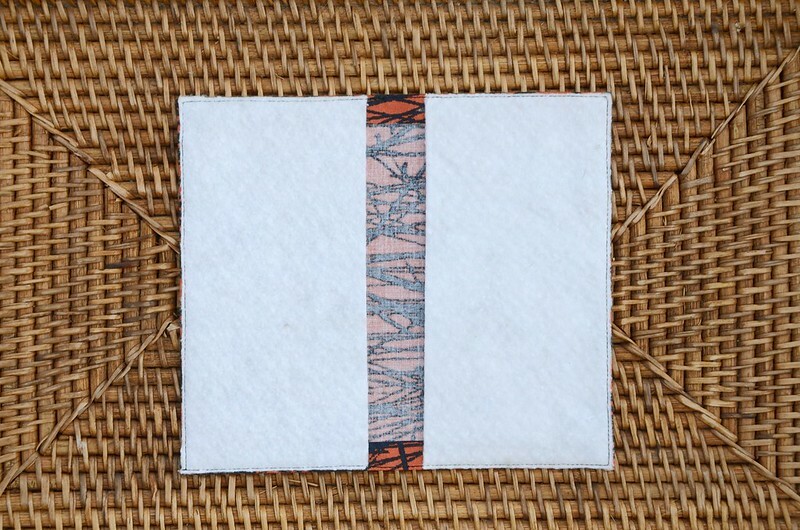 Take two pieces of cotton batting (I’ve used Warm & White here), each one cut to 6-7/8″ x 3-3/8″. 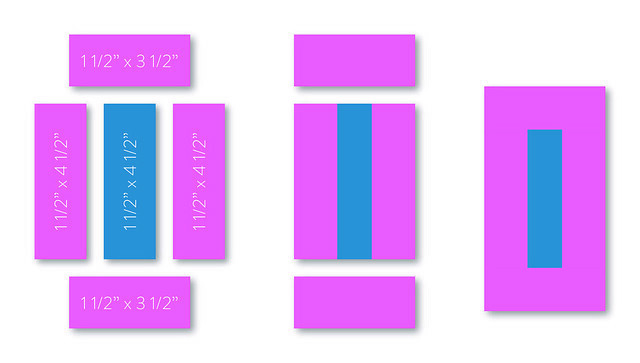 Place them against the wrong side of the fabric, up against each 7″ edge. Sew around the perimeter to hold the batting in place. 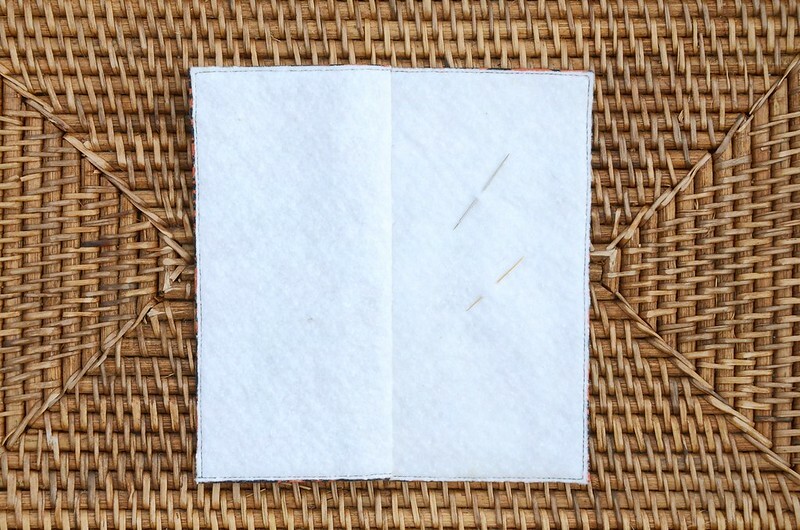 Fold the needle book in half, and sew a line 1/2″ in from the fold line. 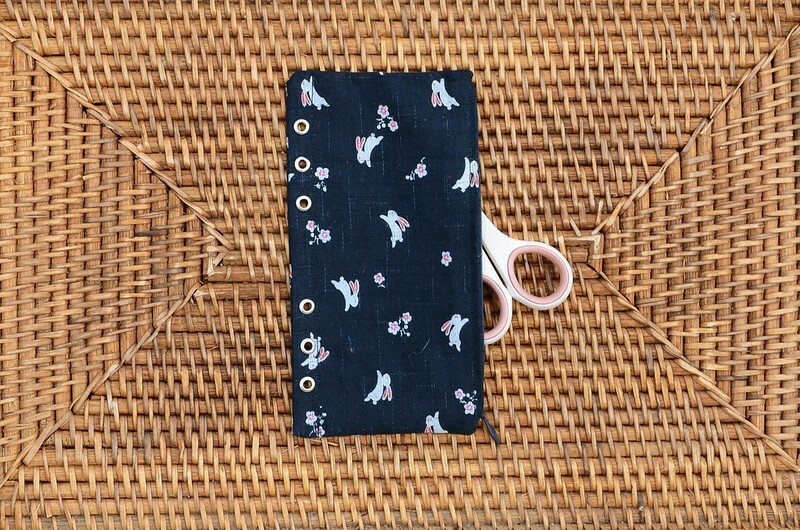 Add 6 x 3/16″ grommets along the folded edge. (The package they came in has instructions on the back, as well as the necessary tools.) I marked the locations using one of the old pages as a template. And you’re done! I also thought it would be great to have a few little zipper pouches for holding some materials for different projects. 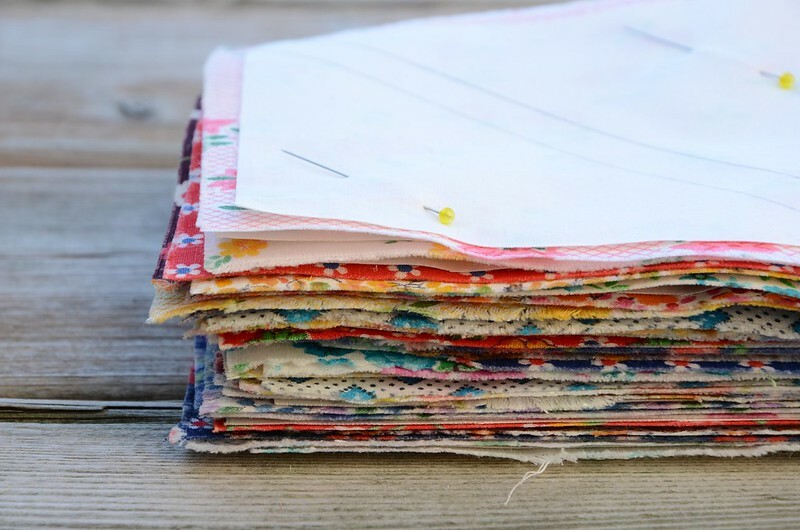 I’m taking Katy’s english paper piecing class, for instance, so I’ll need a place to keep my papers and templates and fabric scraps! 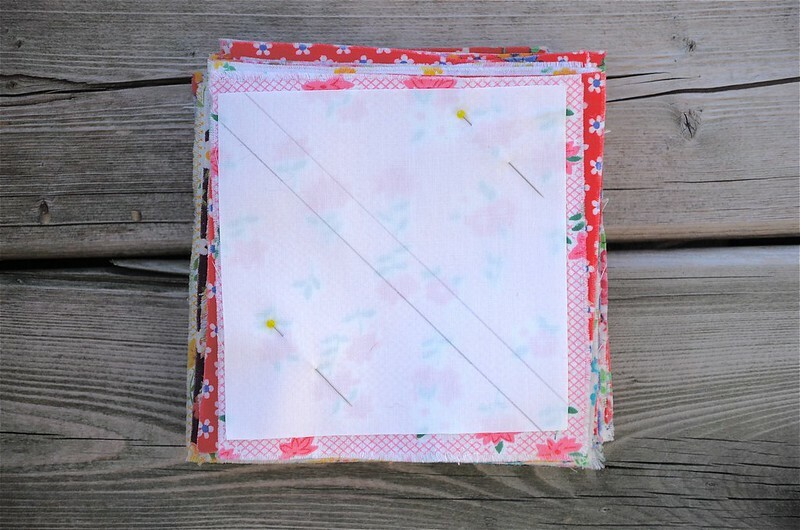 Sew the two long sides together using a 1/2″ seam allowance. 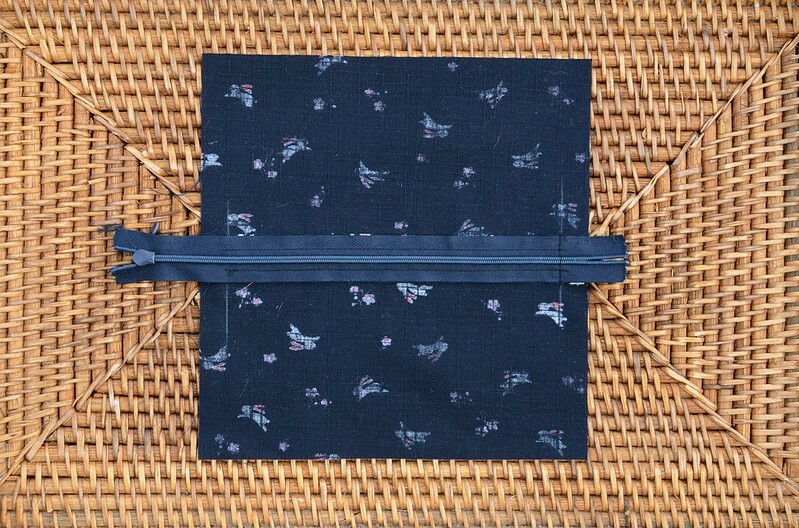 Begin and end the seam with a regular stitch length and back stitching, but for the main length of the seam (about 7″) use a basting stitch. I used a stitch length of 4. Press the seam open. 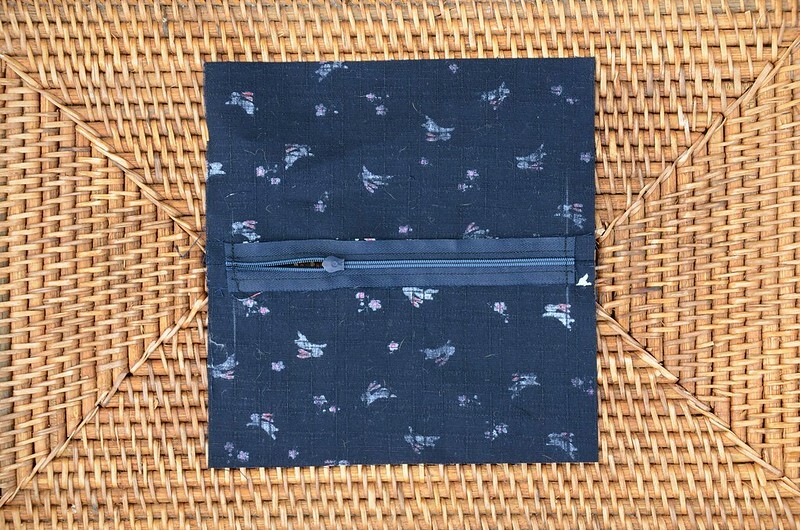 Lay your zipper along the seam on what will be the inside of the pouch. Using your zipper foot, stitch along both sides of the zipper and across the bottom to hold it in place, at 1/2″ from the edge. Pick out the basting and move the zipper pull to the centre of the opening, and then, sew across the other end, also at 1/2″ from the edge. Cut off the excess parts of the zipper. You will notice that I have removed the parts that normally stop the zipper at each end. I did this to keep the bulk to a minimum. 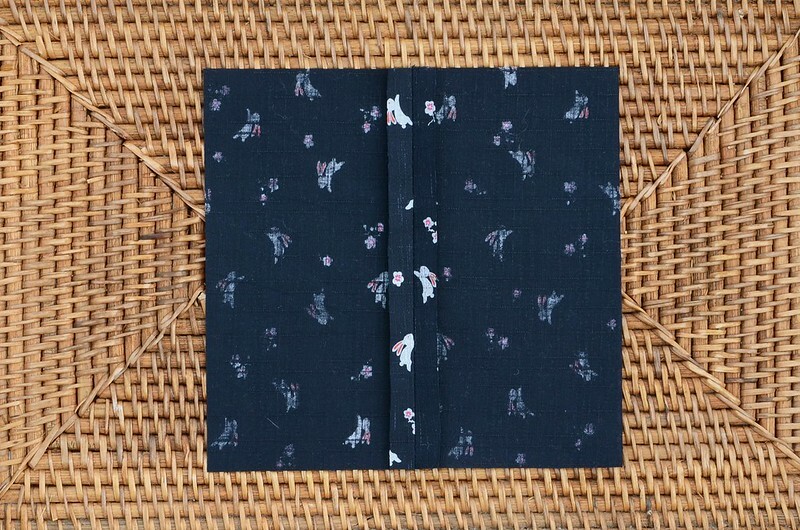 Fold the two sides of the pouch right-sides together, and sew around the other 3 sides using a 1/4″ seam allowance. 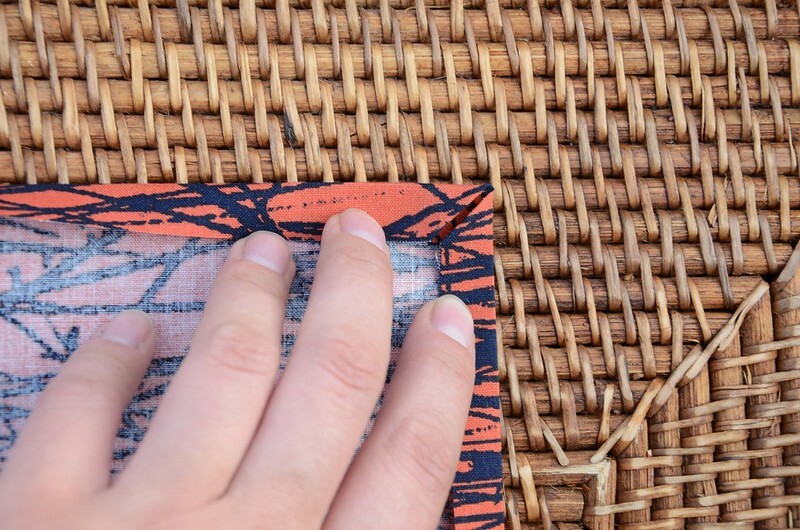 Trim the seam allowance in the corners, and then turn the pouch right-side out through the opening at the top where the zipper was half open. 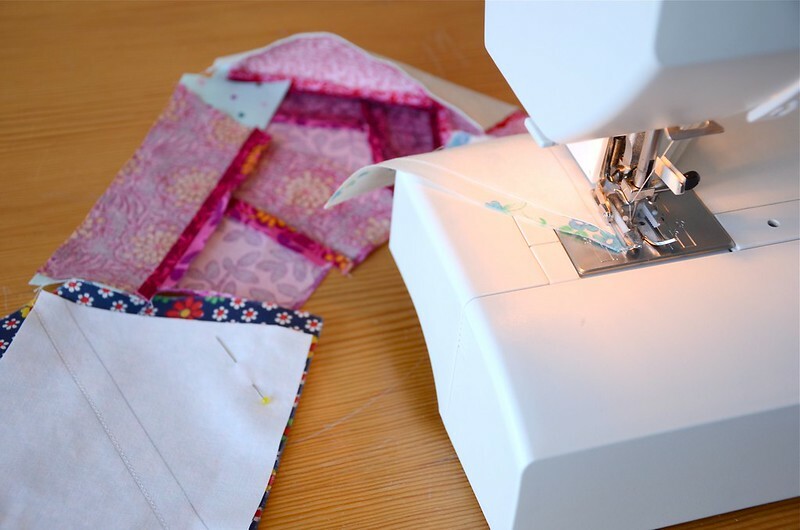 Sew a line of stitches 1/2″ from the long edge opposite the zipper, and add 6 grommets, as you did for the needle book. 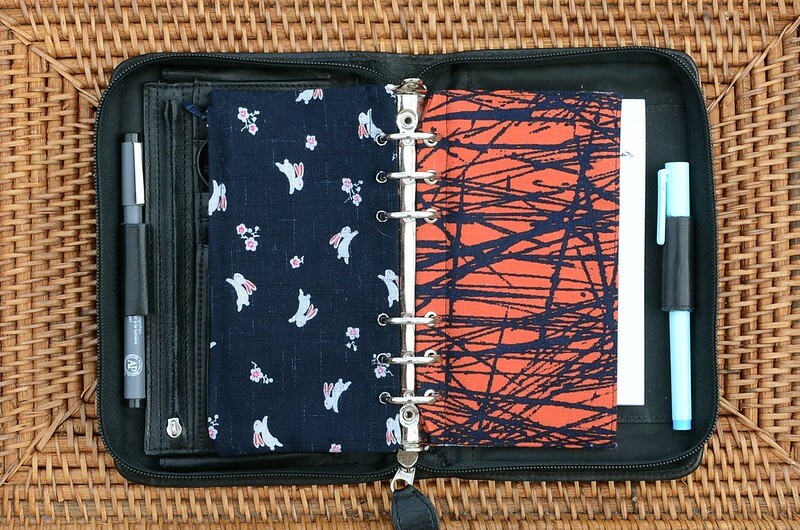 And now you have a mini zipper pouch to keep things in! 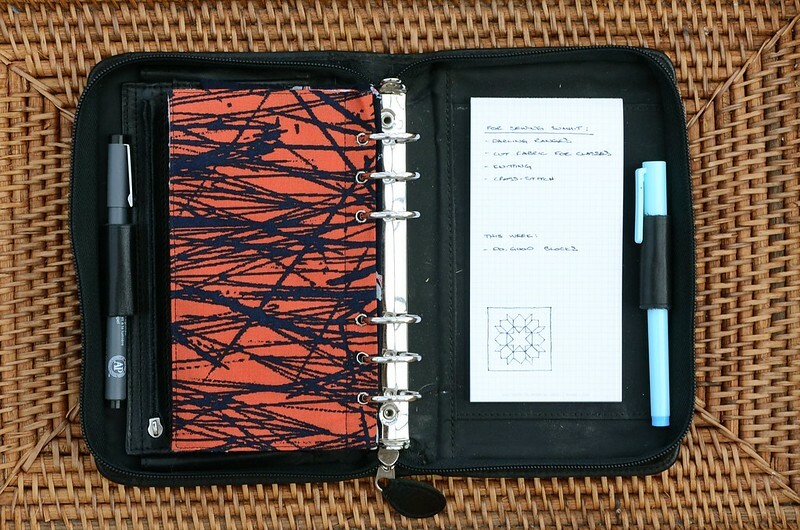 I’m starting to add things to my travelling tool kit, and so far I have a seam ripper, these cute scissors, a pen, and water-soluble marking pen, my needle book and my zipper pouch, and a pad of graph paper for notes, lists and designs. I need to add some address cards to trade with all the wonderful people that I know I’m going to meet, and probably a few other goodies, too! I hope you’ve enjoyed my little projects, and if you end up making either of these, I’d love to see them! You can add pictures to both my Flickr group and the Travel Handmade group. And be sure to check out all the other wonderful projects and reviews that the lovely Sewing Summit organisers have ready for you! 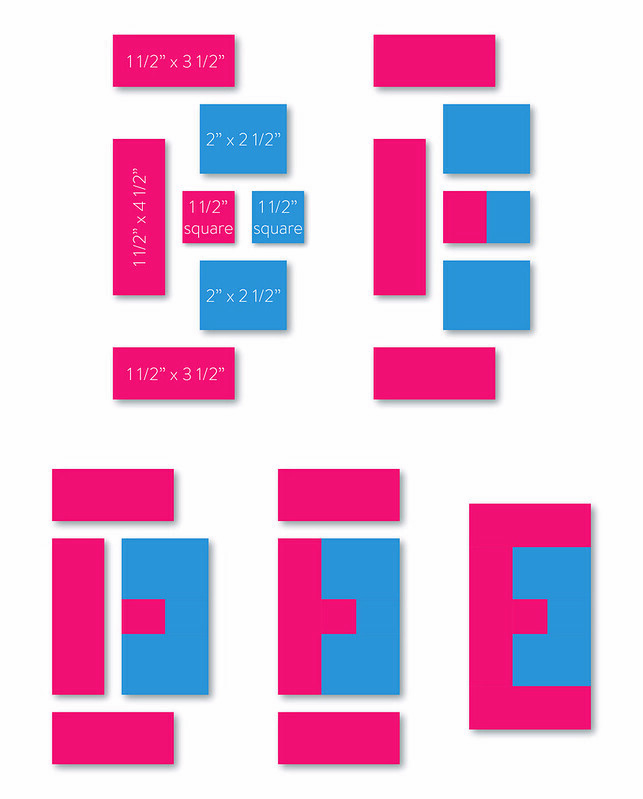 This is not the first time I have posted an image of these charm squares. 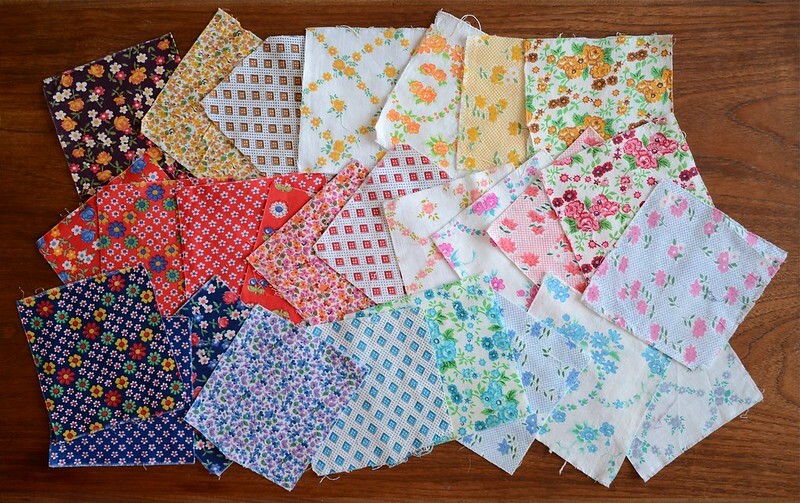 They are from my Nana’s stash…she had already made a quilt with some of them and didn’t think that she would be likely to use them for anything else, so she let me take them. I adore them. I have lots of precious fabric in my stash, but these are right at the top of the precious pyramid. 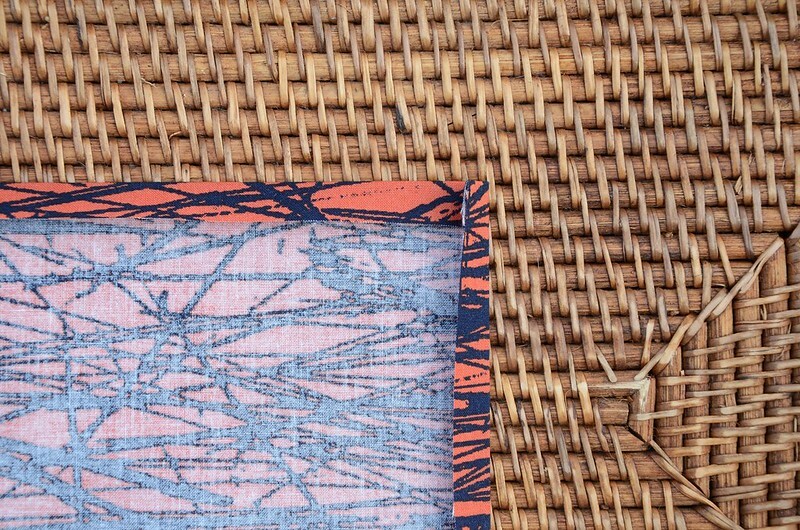 Sure, the Heather Ross prints, and the bits and pieces from the original Flea Market Fancy, might be worth quite of bit on Ebay now, but they are still somewhat available – albeit at an extreme cost. But these are one-of-a-kind. I sincerely doubt I could ever find more if I wanted to. And so I have been unable to decide what to do with them. There is quite a range of lights and darks, as well as reds, blues and yellows, in the stack, so I wasn’t sure what to pair them with. 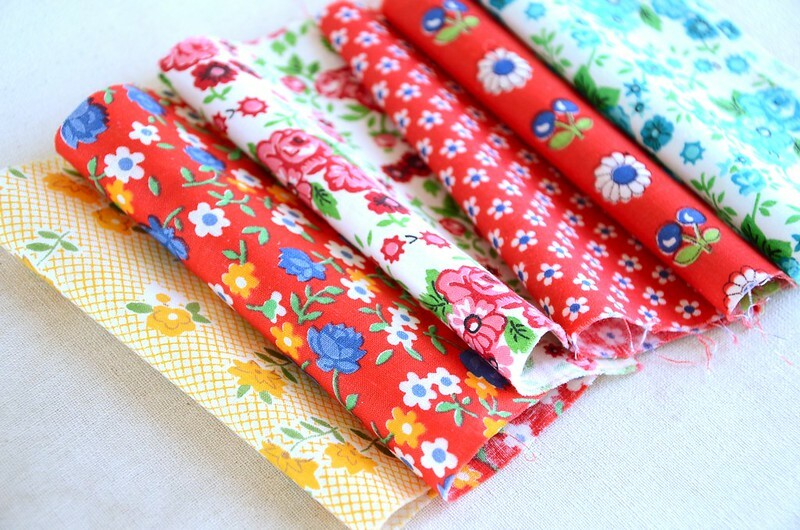 I wanted to avoid just using Kona Snow, even though I find it the perfect white for vintage fabrics because it is ever so slightly yellow. It’s the Cloud White of the fabric world! 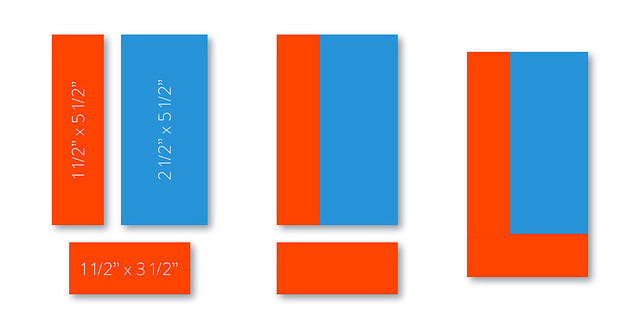 (That’s a paint reference, for the uninitiated.) But I used Kona Snow for my Oh My Stars! quilt, so I wanted to branch out. I took them to a recent TMQG meeting, and it was suggested that I try using a selection of different warm, soft neutrals, rather than just one. 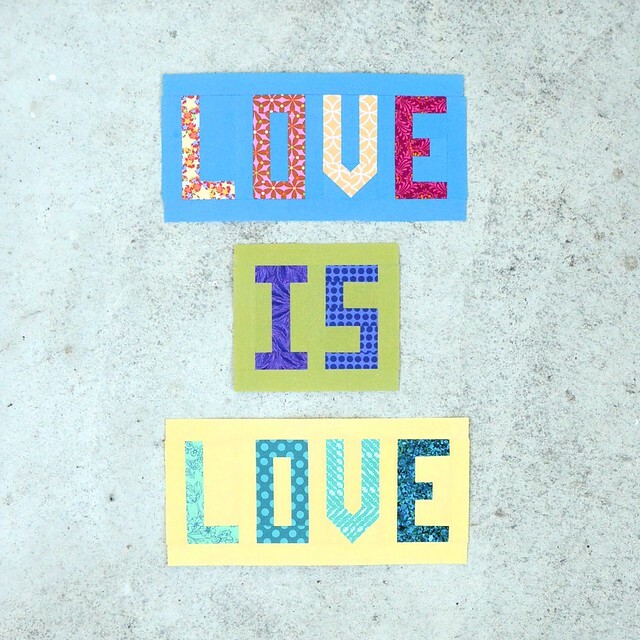 I loved the idea, and it instantly reminded me of a project that Brooke had been working on, and which I adored. 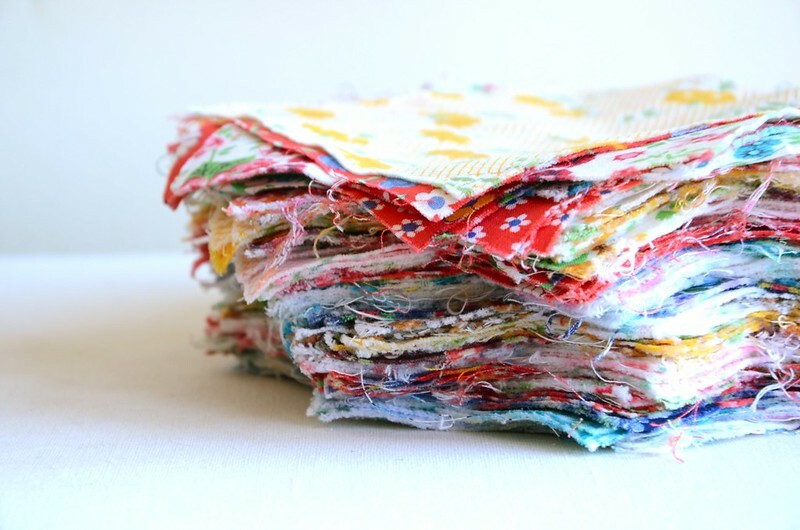 Since I was seated at the central work table at the workroom at the time, I quickly turned to Karyn’s stacks of solid cotton fat quarters and grabbed a few from both Kona and Free Spirit. Then when I got home I hauled out my stash of neutral solids and added more to the pile. 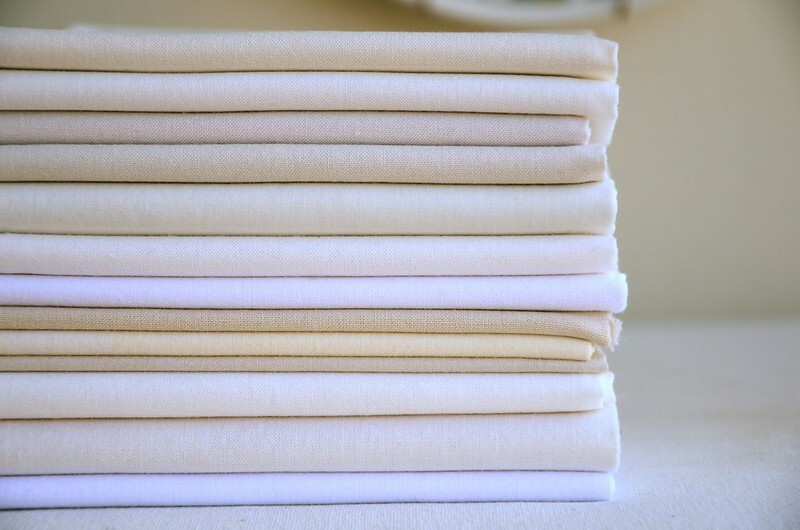 I couldn’t tell you what they all are, since some of them have been in my stash for years and years, but I know that Kona Solids in Snow, Bone, Ivory, and PFD Bleach White, Free Spirit Designer Solids in Pearl, and Art Gallery Pure Elements in Linen White are all in there. 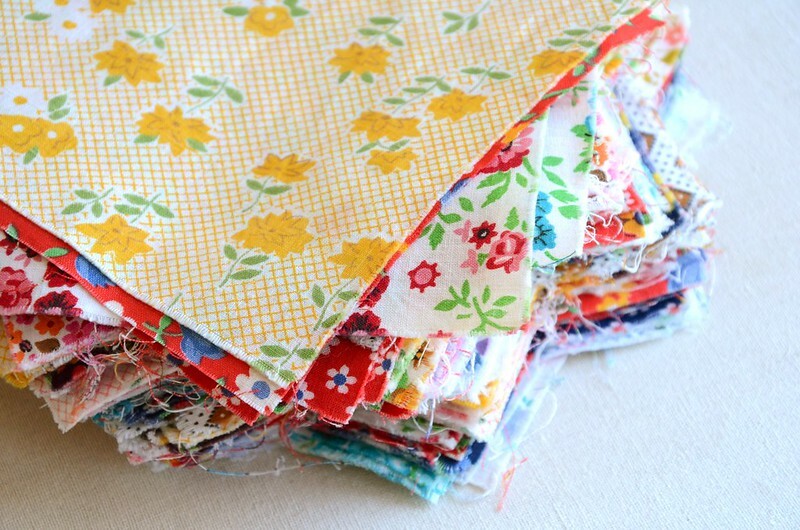 I went through my stack of vintage fabrics, and quickly assessed the largest common size that I could get out of them. 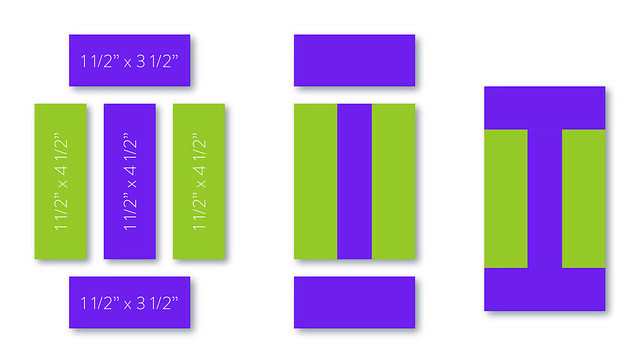 Some would allow as much as 5 1/2″, and some were closer to 4 1/2″, but I could get 5″ out of most of them, so that’s what I went with. Because my plan was to sew them into HSTs, and because those would require trimming after the initial sewing anyway, I didn’t bother to trim them to size. I cut out 5″ squares from my stack of neutrals, marked them with my diagonal sewing lines, and pinned them to my vintage charms. And while I do all this work? Stella sleeps.